I’m about to finish and post my next side project, activitystreams-unofficial. My last post was a side project too, though, so I’m reluctant to post another right away, since I want this blog to be more about other things. Unfortunately, I don’t have anything special to say right now. Life is good, friends and family are good, work and side projects are good. I have a couple future posts brewing, but they’re still too early to write up just yet. 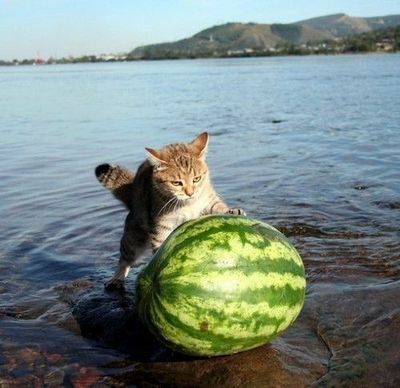 So, uh…hey look, is that a cat rolling a watermelon out of a lake?